I just thought I would give you a few quick thoughts of some current releases. It ended up being far funnier than I ever could have anticipated. The plot is stupid but I laughed a lot- particularly whenever a news anchor Bridget worked with named Miranda was on screen. She was hilarious. Renee Zellweger looks a little different but it wasn’t as distracting as I feared it would be. It includes nods to the first two films (love first film, hate second) without making them obnoxious or overbearing Mostly it is charming and very funny. Terrific film from Clint Eastwood and Tom Hanks about the Miracle on the Hudson when a plane had to make a water landing in 2009. Tom Hanks is the main reason this movie works so well. There is something about him you trust and you want to see him vindicated. It can be a bit by-the-numbers and repetitive but I found it engaging at the same time. I personally don’t think it is as good as American Sniper but it is less controversial and more easily digestible. Has some interesting things to say about media and our need for heroes. Based on the popular novel, Light Between Oceans is exactly the movie I thought it would be. I went into it expecting a period tearjerker with good acting and that’s what I got. For a movie like this to work you need the couple to have good chemistry and that’s certainly true here with Alicia Vikander and Michael Fassbender working so well together. The film looks beautiful by cinematographer Adam Arkapaw. I could look at those ocean shots all day! The melodrama is thick and certain plot developments I didn’t think made sense but if you like tearjerkers this is a decent one. Also, if you are a mother I think you will find it a lot more tragic. This Russian import is the kind of film that is very easy to tear apart. The animation is bad and the dubbing is even worse. I don’t think a single line of dialogue matched up with the mouth movements on the screen. However, I did think there was something to the nutty plot of space dogs that entertained me more than lazy efforts like Ice Age 5. 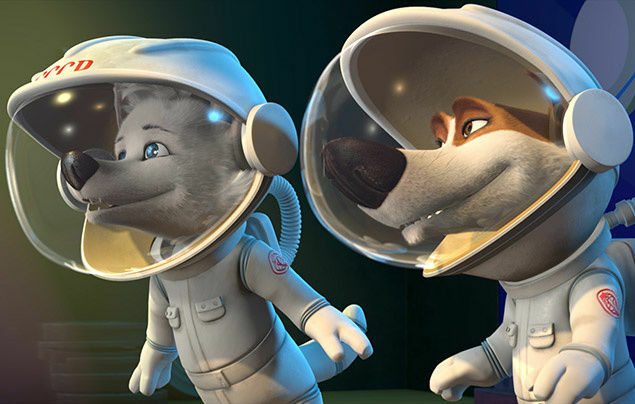 Sure Ice Age 5 is better executed but I’d personally prefer Space Dogs over it. You watch it and just wonder how in the world did this get made? I want to see the documentary about the making of Nine Lives. Barry Sonnenfield, Kevin Spacey, Jennifer Garner, Christopher Walken all fantastic talents behind a talking cat movie? The strangest part is he’s actually not a bad Dad. He loves his family and is anxious to get his daughter the right present. He buys her a cat even though he hates them. Most kids should be so lucky to have such a Dad! It was a fun ‘so bad it’s good’ watch but really when they can’t get the meowing right in a cat movie that’s a bad thing. So there you have it! Have you seen any of these films? What did you think of them? I wanna see Sully. And I’m surprised you went to go see Nine Lives, lol! My youtube viewers begged me to see it and I have to admit I was morbidly curious. You just wonder how this all could happen? Sully was “a dutiful, hagiographic slog.” Ok, so I didn’t say that. That was a direct quote from Dana Stevens’ review for The Slate. See? I was much kinder in my review. Still found this awfully boring, particularly setting the climax of a film about a narrowly averted plane crash around a series of flight simulations in a conference room. Haha. Fair enough. Sorry I was just surprised because I found it a compelling character study. I didnt get to read your review that carefully but you are always fair and I can see how it would be boring for you. I will read the article. Have you seen The Lobster? I really wanted to like it more than I did. Pingback: Denial Review – Reviewing All 54 Disney Animated Films And More! Pingback: Jackie Review – Reviewing All 56 Disney Animated Films And More! Pingback: Pottersville Review – Reviewing All 56 Disney Animated Films And More!